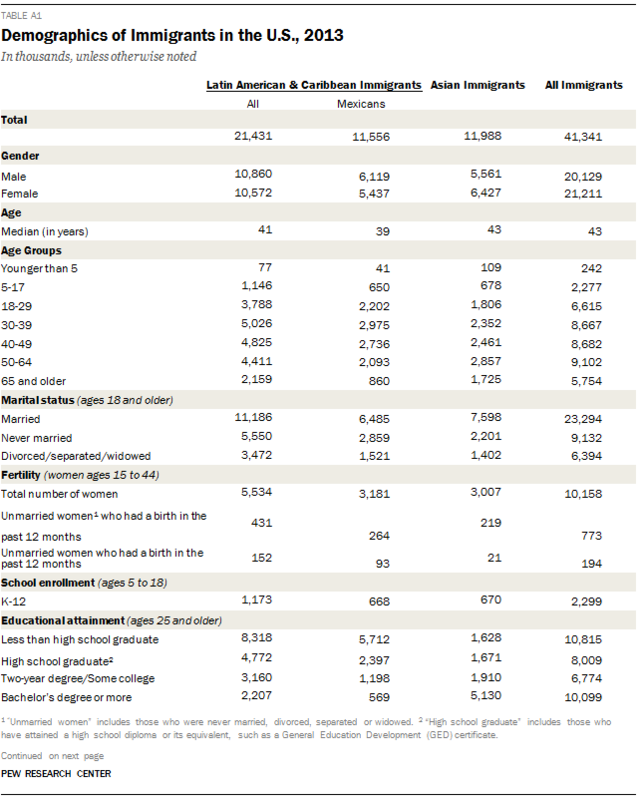 Compared with Asian immigrants overall, Mexican immigrants are younger – their median age is 39 years compared with 43 years among Asian immigrants. Mexican immigrants are also more likely to have never been married (26%) than those born in an Asian country (20%). In terms of fertility, Mexican immigrant women ages 15 to 44 have a higher birth rate (83 births per 1,000 women) than Asian immigrant women (73 births per 1,000). Mexican-born women who gave birth to a child over the past 12 months are also more likely to be unmarried than Asian-born women (35% vs. 10% respectively). Immigrants from Asia outpace those from Mexico in terms of their educational attainment. Half of Asian immigrants hold a bachelor’s degree or more, compared with only 6% of Mexican immigrants. 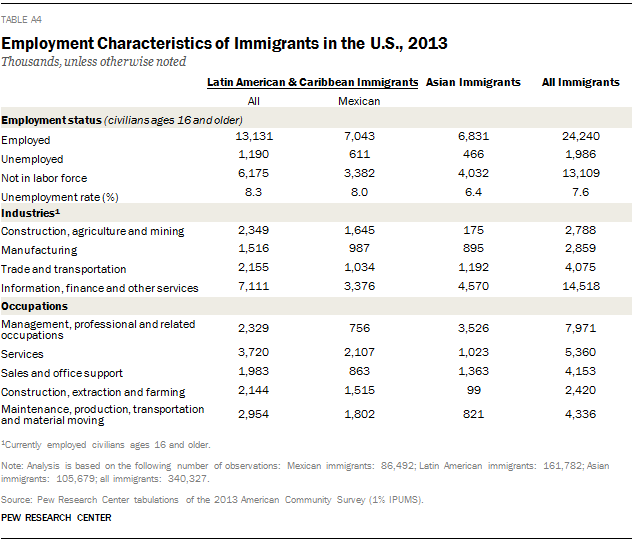 Mexican immigrants also fall behind Asian immigrants in economic terms. 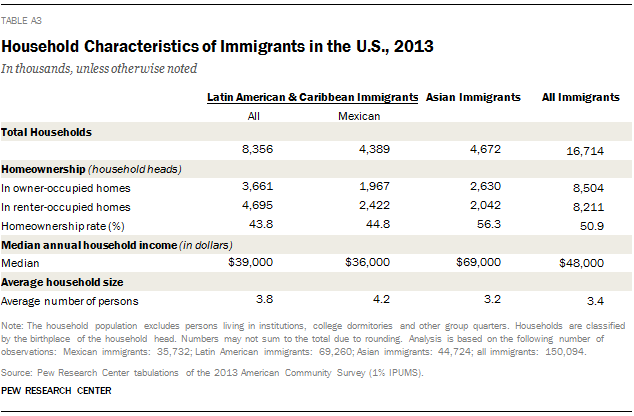 In 2013, the median annual household income of households headed by a Mexican immigrant was $36,000, which is close to half the median annual household income of households headed by an Asian immigrant ($69,000). 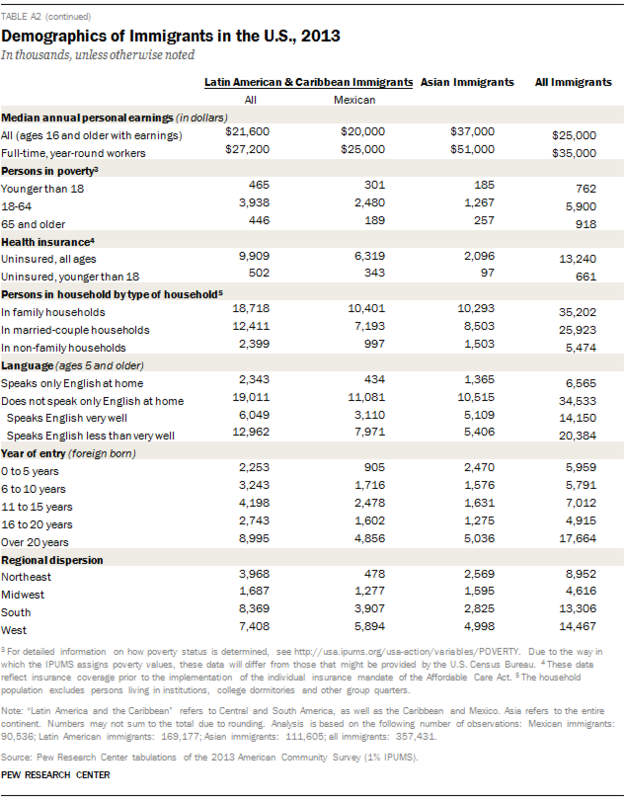 Mexican immigrants ages 16 and older reported median annual personal earnings of $20,000, compared with $37,000 among Asian immigrants. In 2013, Mexican immigrants were twice as likely as Asian immigrants to live below the poverty line (26% of Mexican immigrants vs. 13% of Asians). Mexican immigrants are less likely to be proficient in English than Asian immigrants. In 2013, 31% of those immigrants ages 5 and older born in Mexico were proficient in English, while 54% of comparable Asian immigrants were proficient in English (50% when excluding Indian immigrants). Due to recent trends in flows of Mexican and Asian immigration, Mexican immigrants are less likely to have arrived in the U.S. in the last 10 years, compared with Asian immigrants (23% vs. 34% respectively).